Friends, this feels big. Vegan meatballs made with real food that are full of flavor, don’t fall apart, aren’t mushy, and are easy to make! Let’s do this! This 10-ingredient recipe starts with black beans that have been baked to dry them out – this is important, as it helps prevent the meatballs from becoming mushy. The beans are then blended with herbs, spices, and sautéed garlic and shallot for layers of flavor. Next comes the cooked and cooled quinoa, more herbs, tomato paste, and vegan Worcestershire (which is optional, but it adds more depth of flavor). Pulse a few more times and you’re ready to form your meatballs! After a quick chill in the refrigerator, it’s time to cook (and eat)! To cook the meatballs, we went for a stovetop-oven combo. A quick sauté in the skillet you used to cook the onions and garlic in provides a crusty outer texture, while a bake in the oven dries them out a bit and ensures they’re cooked through the center. At the end, for even more flavor, you can add your favorite marinara sauce and cook for another 5-10 minutes or until bubbly. Swoon. Then it’s meal time! 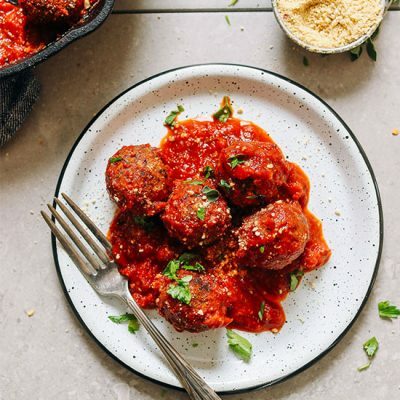 These meatballs are delicious on their own, but they would also pair well with just about any pasta, like our Simple Chickpea Bolognese or 30-Minute Cashew Alfredo or Chili Garlic Pasta with Roasted Cauliflower. I could also see them working well on things like pizza and even sub sandwiches! Melt a little Vegan Mozzarella on top and you’re in business! If you try this recipe, leave a comment, rate it, and tag a photo #minimalistbaker on Instagram so we can see what you cook up. Cheers, friends! 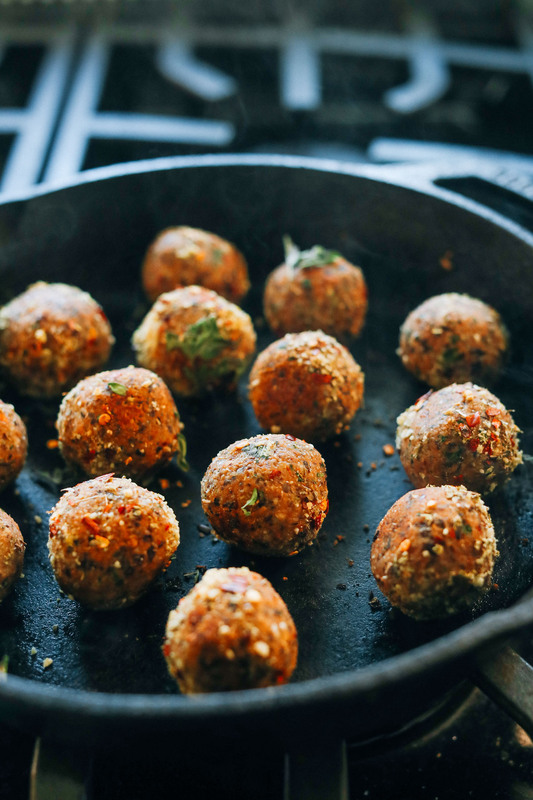 Tender, flavorful, 10-ingredient vegan meatballs made with quinoa and black beans! Infused with fresh herbs, tomato paste, and spices for big flavor. The perfect meatless meatball for pasta, sandwiches, and more! If you haven’t prepared your quinoa yet, do so now (make sure it’s cooked and cooled completely before use). *Prep/cook time does not include preparing quinoa. Preheat oven to 350 degrees F (176 C). Add rinsed, dried black beans to a parchment-lined baking sheet. Bake for 15 minutes or until beans appear cracked and feel dry to the touch (see beans in food processor photo). Remove beans from the oven and then increase oven heat to 375 degrees F (190C). Heat a large (oven-safe) skillet over medium heat. Once hot, add water (or oil), garlic, and shallot. Sauté for 2-3 minutes, or until slightly softened, stirring frequently. Remove from heat (and reserve pan for later use). 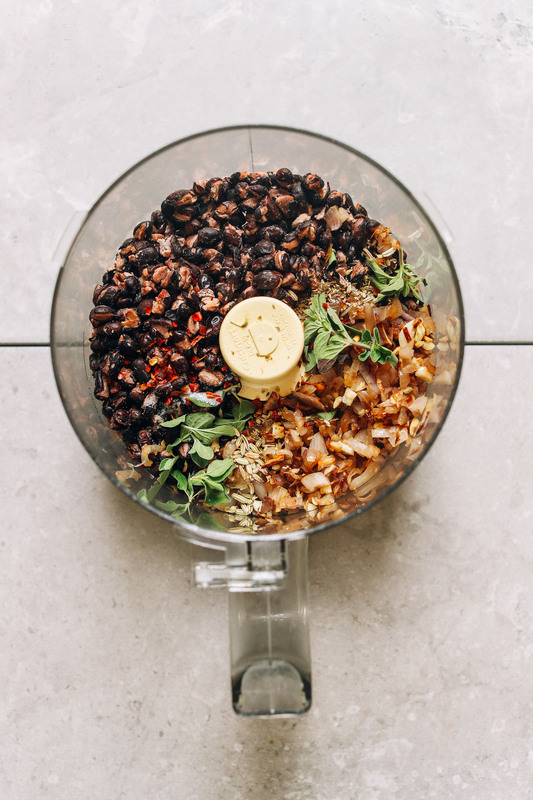 Add black beans to a food processor along with garlic, shallot, sea salt, oregano, red pepper flake, and fennel (optional) and pulse into a loose meal (DON'T overmix). 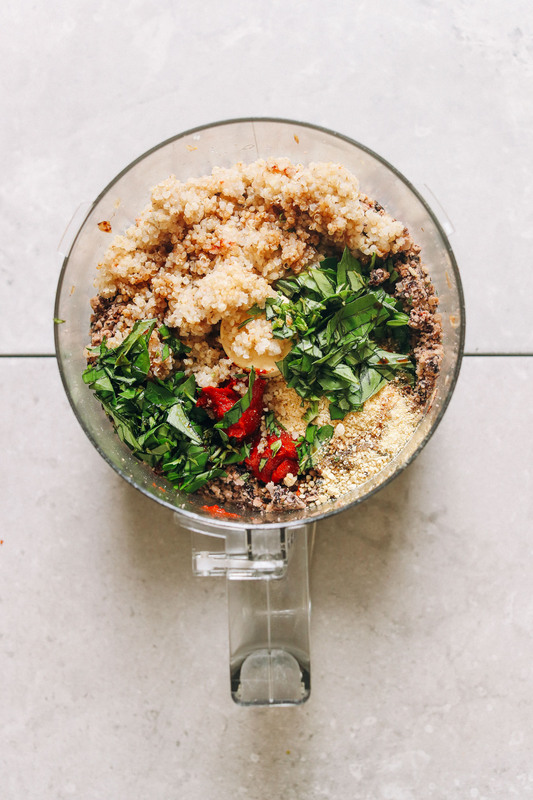 Then add cooked/cooled quinoa, vegan parmesan cheese, tomato paste, fresh basil or parsley, and Worcestershire (optional). Pulse to combine until a textured dough forms (you're not looking for a purée, but it should be semi-tacky). Taste and adjust flavor as needed, adding more salt for saltiness/depth of flavor, red pepper flake for heat, herbs for earthiness, or Worcestershire (optional) for more depth of flavor. If it’s too tacky or wet, add more vegan parmesan cheese and pulse to combine (we added a bit more). Scoop out heaping 1 1/2 Tbsp amounts (using this scoop or a Tablespoon) and gently form into small balls using your hands. Add to a plate and refrigerate for 15 minutes. Heat an oven-safe metal or cast-iron skillet over medium heat. Once hot, add the meatballs and sauté for a few minutes, gently turning the meatballs to get a slight crust on either side. Then transfer to the oven and bake for 20-30 minutes or until golden brown on the edges and slightly dry to the touch. 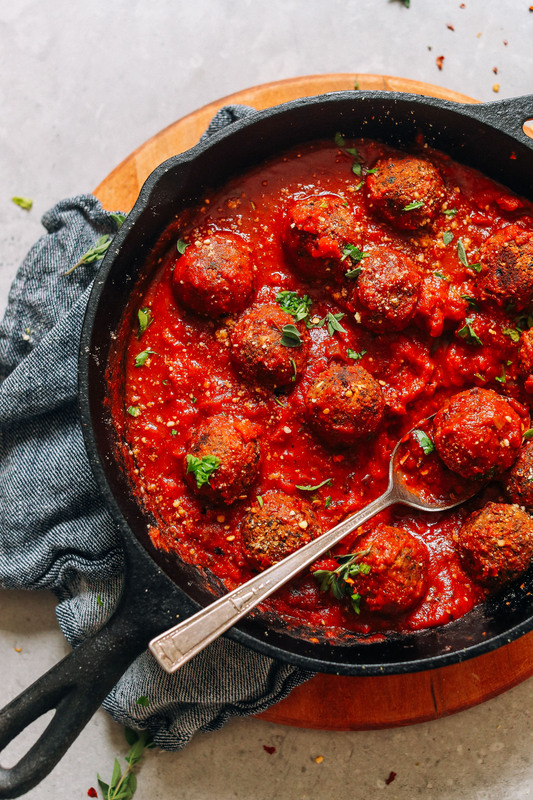 These meatballs are delicious as is, or you can add some marinara to the pan and heat over medium heat for 5 minutes (or until bubbling / hot) to infuse more flavor. Serve with marinara and additional vegan parmesan cheese (optional)! These are also delicious atop any pasta. Leftover meatballs keep for 4-5 days in the refrigerator or 1 month in the freezer. Reheat in the microwave or in a 375-degree F (190 C) oven until warmed through. *1 15-ounce (425 g) can black beans yields ~1 1/4 cup beans (after draining excess liquid). *Prep/cook time does not include preparing quinoa. *Nutrition information is a rough estimate for 1 of 12 meatballs calculated without optional or serving ingredients. Could I leave the raw meatballs in the fridge overnight and cook the next day?? Very excited to try these!! Question: when you bake the meatballs, is that at 350 or 375F? 375 F. Hope that helps! Made this for the family (made two batches), absolutely fantastic, simple easy to make. Had all the ingredients in my food cupboard except for the vegan parmesan cheese (used B12). The family loved it, my daughter especially because she has been a vegan for a few years. These are INCREDIBLE & sooo filling we had leftovers i made into ‘beanball’ subs ;) I made these to go with the ‘cheesey’ squash and it was perfect and hearty. I did feel lik the food processor was a bit unecessary so i put all the ingredients (i didnt use worchester sauce) in a bowl and mixed it with my hands and they came out even better than expected. Will definitely be making these again! Thanks for sharing, Amanda! So glad you enjoyed these! Can I freeze the fully formed meatball dough in the freezer or do I have to heat them before freezing? We haven’t tried that, but think it would work! If you give it a try, let us know how it goes! Are there good substitues for the quinoa? Do you think brown rice could work? Is the quinoa mostly a binder or filler in this recipe? We haven’t tried that, but think it would work! Let us know if you give it a try! I seriously cannot believe how easy and delicious these were! I was almost speechless when I first tasted the “dough”. I had been curating vegan recipes for our Daniel Fast and these fit the bill perfectly. Even my carnivore husband had to admit they were pretty good! Hi, I was wondering if they would still turn out fine if I left out the vegan parm or it I would need to use a substitute. We think the vegan parm is pretty essential for flavor/texture, but some other readers have substituted nutritional yeast and macadamia nuts with success. You could also potentially try breadcrumbs plus a little nutritional yeast. Hope that helps! I left out the parm and they were perfect! I forgot the 15 minutes’ refrigeration and they seemed okay. I like kick, so for my double recipe I used a smallish jalapeño and some chipotle pepper flakes. My one other modification comes from laziness: I skipped the frying part, but wiped a baking sheet with a thin coating of olive oil and lightly brushed some on the meatballs. I then baked them for about 25 minutes and finished them gently under the broiler for about five minutes, turning once. Served with homemade marinara from an Italian deli. Made these this weekend and they were delicious! Followed the recipe as it was (used Henderson’s Relish in place of Lea and Perrins Worcestershire Sauce) (for British readers!) and served them with wholewheat pasta, home made tomato sauce (Marinara) salad, and garlic bread made with sunflower spread. Thank you Dana! Oh my GOSH, these are incredible. My meat eater fiancé loves them too. So good. Will be telling all my friends. Thank you for this new stable in my dinner rotation! I made this but used it for stuffed tomatoes cooked in the crockpot with marinara sauce. I added some chopped sun dried tomatoes & mushrooms & spinach. Delish! These were delicious! I didn’t have any vegan parm on hand so I substituted nutritional yeast and used all fresh basil. Food processor decided to die so I mixed/mashed all ingredients in a large bowl with a fork and they still turned out great! I paired these with vegan tuscan pasta……YUM!!!! I never usually comment on recipes but this one I couldn’t just make it and leave it alone. These were AMAZING. I had to restrain myself from eating all of the meatballs after my first bowl. I did not sub any ingredients or change any measurements. They were so flavorful and the perfect blend of spicy, and savory. I do recommend leaving the fennel in, it’s so good with it! THANK YOU!! My Italian husband is so happy. I’m happy. You made my night with this recipe! 1 cup cooked quinoa equals 60 grams uncooked quinoa. Hi! We made these “beanballs” last night for dinner and they were the one of the best, most flavorfull meals we’ve ever eaten. Since were not vegan (or vegetarian), I used “real” parmesan cheese und worcestershire sauce. I didn’t sauté them first but put them right into the oven and they came out crispy on the outside and just a little mushy (the good kind) on the inside. I have just a hand blender so I was a little nervous about the consistency, but all went fine. So good I had to take them away from my husband because he threatened to eat them all. Delicious! My 4yr old enjoyed rolling them too. Will make a double batch next time. Yay! We’re glad to hear that, Evelyn! THESE ARE THE BEST! I added a handful of walnuts for nutty flavor and spinach to sneak in some greens but this was QUICK, DELICIOUS, and nutritious! Huge flop for me. The meatballs are soft and fell apart. I added red onion instead of shallets? Id love to make them again, any suggestions? Hmm, that’s so strange! I certainly didn’t experience any trouble with these crumbling. Perhaps next time form them a little tighter and add more tomato paste for binding? Dana! You did it again.. These are THE BOMB. Thank you so much for your delicious creations. We’re glad you enjoyed them, Danielle! I have to say, I had low expectations for these and was pleasantly surprised! They were great!! So happy to have found your site! I am all about minimal ingredients! Hi!! 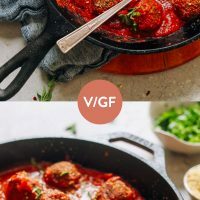 I love this recipe and have made it a few times now but i’m having some trouble when i’m browning the meatballs on my cast iron. They keep sticking to the pan (no matter how much oil I use).. any ideas on how to have them not stick while trying to sear all sides? Hmm I’d turn the heat down a bit in the future, but it might also be the pan.. I am trying to figure out what went wrong. I followed your directions and when I took them out of the over they all went flat like one giant pancake. That is bizarre.. did you happen to change any ingredients? I used regular onions instead of shallots but thats all. The flavor was very good. Hello – i used dry red beans from a bag (not can) and then followed the recipe to dry them in the oven. I’m getting a dry nutty taste in the meatball, so now i’m thinking I extra “dried” by beans…? was is this the actual texture that I should have? maybe soak the beans first then oven dry…? not sure. I would have probably used canned red beans for best results! I’m making this right now and I’m confused. I cooked a cup of quinoa and set it aside, but it yielded about three cups quinoa. Do I use all three cups of the quinoa, or only one of the cooked cups? One cup of quinoa AFTER cooking! Hmm I’m not sure.. we would definitely recommend using a food processor, but if you try out your other kitchen tools, let us know how it turns out! I subbed quinoa for about a half cup of cooked very thin rice noodles that I chopped. Added about a quarter cup of mushrooms that I dried in the oven along with the beans. Added a quarter cup of homemade breadcrumbs. 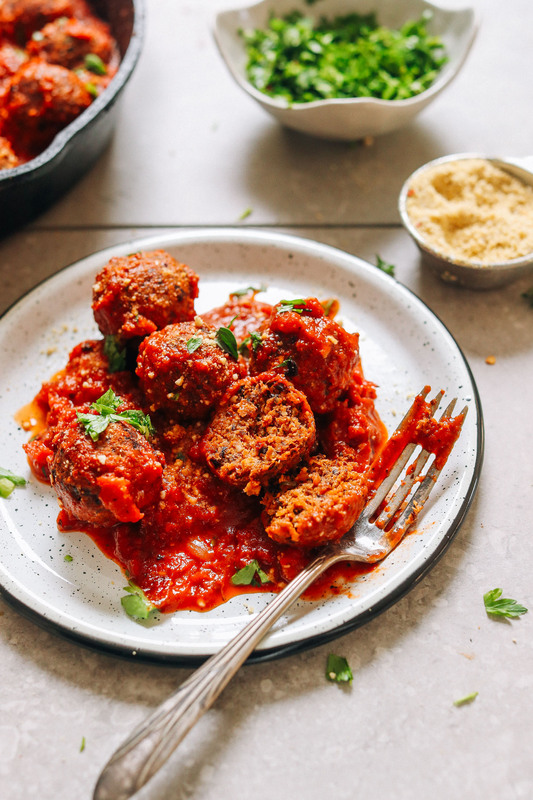 These may be the best vegan meatballs ever. If you substitute just make sure to keep the moisture level in mind else they may fall apart on you ! I made these the other night and they turned out pretty good – the only reason they were not great is because, for me, the 3T of parsley and basil (which I combined) was a bit too much. I love parsley and basil but I did find them to overpower the rest of the flavors. That is just for me. I will reduce to 1T. I also did not have cashews to make my parmesan so I used a couple of tablespoons of nutritional yeast. I will use the vegan parm next batch. I ate these with zucchini noodles and a jarred tomato sauce. I will make my own marinara sauce next time. I will also double or triple this recipe because for the clean-up it is worth having a double batch. Thanks for sharing your experience, Lori! I am just in the process of making these, omitting fennel as I was out, using dried oregano and only fresh basil as I can’t stand parsley…and the mix tastes amazing! My only concern is that the meatballs are about to completely fall a part and they have stuck to the pan. Do you have any suggestions of how to create more compact balls, or whether you would recommend adding some oil back into the pan prior? Thanks! But these meatballs fell super short. Even though I added all the additional ingredients, I thought they really lacked flavor. Maybe they’ll taste better after a day? Only thing I was super stoked about, was they did keep their shape well. Meatless meatballs have the tendency to fall apart. O they are so so good, thank you! Made a large batch and froze half last week , paired with the marinara they are perfection! I typically am a plop-it-in-the-sauce and let it simmer until cooked type of gal with my meatballs. Do you think this recipe could be just plopped into some sauce and simmered? Wondering if they would hold together…thanks so much for posting this, can’t wait to make these! Regarding the dried beans…do you mean cooked dried beans? I tried the recipe for our Sunday lunch. It was delicious. As well as the marinara sauce. It took me a bit longer than I thought… next time I will be a bit more effective. And will prepare a bigger quantity. Thank you for your excellent recipes Dana. I made the meatballs for dinner tonight and they were sooo delicious even by themselves. I made a veggie tomato sauce to go with And some quinoa and it was awesome!! I used fresh parley verse the oregano and also some dry Italian mix in the meatball also. I didn’t have any Worcestershire sauce but it still turned out great. This did take some time to make this isn’t a quick recipe. Also if you have a big family you may want to double recipe, mine made about 8 meatballs. Every recipe I have tried by Dana has always been good! Made the recipe (tripling it because we were having a party and serving meatballs as an appetizer) and it was good. They stick together, they have a nice texture, though I think I needed to adjust the flavour with some more salt as they could be a little less bland (no Worcestershire sauce used because we didn’t have a vegan version in the house and that also might’ve helped). An excellent addition to these “meatballs” though was this recipe https://simpleveganblog.com/sweet-and-sour-sauce/ for sweet & sour sauce. It was super easy and fast, with ingredients we always have in the house. Perfect! For ratio reference, having tripled the meatballs, we quadrupled the sauce recipe. I think maybe x5 would be better but I do like things saucy and with the quadrupled they did get a light coating all over so your call. Thanks for the meatball recipe. It’ll definitely be a keeper. These are great! I just discovered yet another reliable recipe to use often in the future. Thank you for your minimalist/simple yet delicious recipes Dana! Would these hold up if I wanted to put in a crockpot with marinara sauce and warm/heat for an hour or two? Or would they fall apart? Thinking of making these for a potluck. Hmm, thinking they might get a little tender in the crockpot. But if you give it a try let us know! Will do! Thinking maybe I can keep the sauce heating and will add the meatballs in the last few minutes to the crock pot. Want to make these for NewYears day.Visiting our of town and don’t have my food processor but Friend has an electric mixer.Will this work? It may, though we haven’t tried ourselves and can’t say for sure! I just made this for Christmas. I have always loved Italian on Christmas Day and these “meatless” balls were the 💣-diggity! I didn’t have fennel on hand but otherwise followed the recipe to a T. Wow – Thank you! I even made a post-dinner “meatless” sub with the leftover balls and vegan parm. Like how can you miss meat with recipes like this? Thanks for making my Christmas merry and bright by allowing me to continue to indulge in past traditions – with a 🌱 twist . Hi there. I am doing a grazing station for Christmas with my family. Would these work to sit in a crockpot with sauce or would they start to fall apart being the crockpot for a long period of time? Hmm I’m not sure as we haven’t tried it, Michelle! Let us know if you give it a go. Good luck! I used dried oregano and felt that 2.5 tsps of it was way too much. Typically dried and fresh herb amounts are not supposed to be the same – is the 2.5 meant for fresh then, and dried should be less? Other than that, these were tasty. Thanks for sharing! I’ll make a note for other readers about the herbs. This recipe turned out really great for me. They stayed together really well even after adding the sauce and tasted amazing! They stood up even as leftovers the next day. Highly recommend this recipe! I made these last night for my family and my wife and I thought they were absolutely delicious. My kids still preferred “Dad’s own recipe” that I’ve made for them for years, but I’ll be making these from now on I think. I used onion instead of shallots and dried instead of fresh basil but that didn’t seem to be a problem. If I had one issue, it was that they were very soft so when I poured the sauce into the frying pan to heat the balls up a bit they started to fall apart a little. When I then served them any pressure from the serving spoon etc would squash them. If I could remedy that, they would be perfect. I really like the texture. These are the best vegan meatballs I’ve had. I just made these and am so pleased with the results. I doubled the recipe so we could have for dinner tonight and lunch for Mon + hopefully Tues (if it lasts!) I followed the recipe with two exceptions: I did not include the optional ingredients, and I used real dairy parmesan in place of the vegan parmesan. I paired this with your marinara sauce, I threw in some diced onion and oregano to the sauce as well. This is a recipe I will keep on hand and continue to make. Instead of making the quinoa beforehand, I cooked it while the beans were baking. Then, I spread the cooked quinoa on the dirty sheet pan and popped it in the freezer for 10 min to get the quinoa to cool down. Is it 1 cup of cooked quinoa or 1 cup of dry quinoa, cooked? I made this per the recipe. I didn’t have any left over grains in the fridge so went ahead and cooked some quinoa, attempted to dry it somewhat in the pan, cooled it and then proceeded with the recipe. Thought that sauteing the garlic and onion separately and drying the canned beans was a little over the top, but did it anyway. The combination of flavors was really good and I liked that they tasted different to any bean burger/meatball that I had made before. Served with marinara and spaghetti, with spinach and broccoli. Next time, I think I am just going to quickly whiz it in the food processor and use it as a burito filling. Do you think that boiling rather than baking would work for this recipe? I personally feel that boiling would yield a more moist “meatball”. I want to qualify my question I am suggesting boiling instead of frying. Wow! These meatballs are AMAZING! After cooking in the oven, I simmered them in marinara and then put in sub rolls topped with cashew mozzarella! It was literally one of the best meals I have ever made! Thank you, thank you, thank you!!!! I made this recipe and it was soooo flavorful. I am not a vegan so I used regular Worcestershire sauce. The black beans added a great texture and bite to the meatball. I also REALLY enjoyed the vegan parmesan (used the whole jar)! I ate it with spaghetti squash and I definitely will be making it again! First of all thank you so much for this recipe! Only issue I had was that they were not holding firmly enough. It might be due to the size of the cans, because where I live, black bean cans come in 400g and it is a little less than what you get in your 15ounce cans…(we are getting ripped off ;-)!) So I added a little bit of wheat gluten (1 tablespoon) to it but I suppose any kind of flour would work (oat flour, flax seed flour). AND last but not least they were fabulous with my secret fennel roots drunken tomato sauce!! Thank you Dana, I will be making these again and again!!! I followed this recipe to the letter and had the same experience as others of the meatballs just falling apart when I placed them in the sauce. They couldn’t be moved, stir, or simmered without disintegrating. I baked them the full 30 minutes, baked my beans nice and dry, and cooked and cooled my quinoa on a paper towel-lined baking sheet in the refrigerator to ensure it was completely dry. Think twice before adding sauce to these! OMG, this is the best meatballs ever, thank you. My daugthers are vegetarian, but they are very very picky, they love it. I’m dying to make these. Can I use amaranth instead of quinoa? Hi there! I only have an immersion blender to hand… do you think it would work? I made these exactly as your recipe says and they were amazing! I’d like to make them again but I have a question about the refrigerating step. If I prep them a day ahead so I can pop them into the oven after work, can I leave them in the fridge overnight? This won’t ruin them somehow? AMAZING!!! I used pinto beans, as I didn’t have any black beans on hand, and just used regular nutritional yeast. SO good, better than “real” meatballs!!! I made these AMAZING vegan meatballs and I couldn’t be more obsessed- along with all the people I fed them to. I’m already looking forward to dinner time tomorrow so I can eat the leftovers. I didn’t use Worchestor sauce just because I didn’t have any on hand. Still delicious. I served the meat balls over spaghetti squash and used Trader Joe’s marinara sauce. Super delicious. Great! Thanks for sharing, Meg! My first attempt at cooking a vegan meal and I’m hooked. These were so good! I’m trying your lentil stew next. Yay! We’re glad to hear that, David! I just made these and they fell apart in the sauce but were amazing anyway. I eat eggs occasionally and Im going to add an egg white next time to bind them unless you have another suggestion! held up wonderfully in the sauce and tasted really good. The only thing I would change personally if I made them again would be a little less pepper flakes so my toddler would be less picky about them tasting too spicy. Otherwise, delicious! Thanks for another great tasting meatless recipe. Can you also use dried black beans, ie not tinned? And if yes, then does this mean you can cut out the drying process? Thanks. Is there something I could substitute tomato paste for? This recipe looks amazing but I’ve got a tomato allergy! Thanks for all your beautiful recipes!! Question: any recommendations for substitutions for quinoa? Looking for low carb alternatives. Thank you. Btw these are great! Not that they’re lower carb options, but I think that rice or couscous would be the best alternatives to quinoa in this recipe. Hope this helps, Fran! Hi Ellie! The beans do need to be mixed really well with the seeds and everything, so I’d say start in your blender, then transfer to a bowl to mix the rest! Thanks so much! I’m excited to try, I hate it when I have unused beans in the fridge that don’t have a purpose. Never a problem with chickpeas, though, I eat them like candy (strange, I know)! These were wonderful and held together so well, even after reheating the next day. I skipped the fennel and worcestershire as I did not have them on hand. I used some spicy oregano from my garden which kicked the heat up a bit. I topped them with a pumpkin chipotle sauce I had left over. PERFECT for a rainy fall evening. I made a double batch thinking I would have lots of leftovers for the week, but because my husband loved them so much, they did not go as far as I had hoped :) This was also my first time making your vegan parmesan–super delicious and easy. Both recipes will definitely be repeats in our home. Forgot to rate it on my previous comment! THE BEST V MEATBALLS! So good! My siblings and I made this recipe last night as a dinner for the rest of this week. I used fresh oregano and fresh basil, and did not use fennel. I used the food processor for the beans, garlic, and onions, but then when we added the other ingredients we used a soup bowl and used our hands to smoosh it :D! Forgot to put it in the fridge before the pan, but it still worked out great. THEY TASTE DELICIOUS! We squeezed some lime juice on them, and OH MY GOSH so good. We’re pairing it with cauliflower rice and carrots for dinner. Can sweet and sour sauce work? We haven’t tried, but if you do, report back! Didn’t use fennel seeds or red pepper flakes. But other than that I followed the recipe to a tee. It was really great. I made the suggested vegan parmesan which was good and I think that really improved the texture of the meatball. I added a basic marinara sauce and spaghetti squash with these meatballs. Great vegan option. Yay! Thanks for sharing, Anessa! Pre-made these last night and put them in the fridge so I could bake them today with zucchini noodles. My carnivore boyfriend just discovered them this morning (clearly I didn’t do a very good job at hiding them…) ate them COLD & RAW and texted me about how amazing they are. Safe to say if they taste that good without sauce or fully cooked they’re gonna be absolutely incredible!!! Recipe was so easy, only change I made was I used nutritional yeast instead of parmesan since I have not found any veg parm where I live but I will pick up cashews and make your parmesan cheese recipe so I can have some on hand. Thanks a lot for this!! Can’t wait to make these but I do have a question Would I be able to make several batches and freeze them for later? Yes you can! Store in the freezer for up to 1 month. Reheat in the microwave or in a 375-degree F (190 C) oven until warmed through. I attempted this recipe but I think I over-pulsed the mixture and it was more like a paste. But, I cooked the mixture in a fry pan and added some homemade marinara sauce to make a bolognese instead!!! It was absolutely delicious!! Even my hubby who is a meat-eater said it was the best pasta he’d ever had. So, if you stuff the recipe you can always make a delicious bolognese using this recipe and some marinara sauce!! Way to make lemonade from lemons, Emily! It sounds like you may have over-pulsed as you mentioned but we are glad you enjoyed it in the form of bolognese! – I used red quinoa, not sure if that affected the flavor but they looked a lot darker which I was into. – One time I left out the worcestershire sauce, the other time I subbed it with soy sauce, which I think worked great. – I’d recommend making a double batch if cooking for four. – Is took me closer to 40 minutes to get the beans to the right texture, but that may just be my oven. Whoop! We are glad to hear that you and your parents enjoyed them, Will! Thanks for sharing your recipe changes! As a new vegan, these are a lifesaver! Seriously. 3rd time making these. Always follow the recipe exactly expect I use nutritional yeast instead of the vegan cheese. Comes out perfect every time. Thank you for this amazing recipe. We are so glad to hear that, Jettie! I’ve made this twice as meatballs and it was delicious. This time I used it as a filling for vegan cabbage rolls and it worked perfectly. Thank you for all the delicious recipes you share! ok! So, let it be said that my mother-in-law’s meatballs are beyond belief!! Straight from Italy and all of the Italians bid her homage for her cooking (eggplant sandwiches!!) Enter an American Girl I have learned some of her recipes but she is the master, she would beat any chef hands down. that being said. Due to a number of medical conditions, I try to eat gluten, oat, all dairy (including cheese and eggs), white sugar free, yada yada yada. It can be trying at times. Texture is a real issue. You can get close to the taste of things but its the texture that is the kicker. Today I was doing my food prep for the week. Veggies, blueberry cobblerish thingy, brussel sprouts etc. Had been flipping through Pinterest and came across this recipe . All I can say is WOW!!! FABULOUS!!! and everything else!!! These are really tasty and the texture is nice!! I have sent pictures to my girls telling them what I did today. These are the only thing pictured in the messages!! I have to admit that I’m the kind of cook that doesn’t really measure everything exactly. Even after reading all of the comments about the softness etc. they still came out awesome!! As stated no cheese but I did use the nutritional yeast. I processed the fennel a bit in the ninja before adding the other items. When we make sausage (!) we always grind our spices, just our preference. You did an awesome job at replicating not only taste but texture! Bravo!! And I will also say that your chocolate chip cookies are awesome also! I will certainly be following you!! Thank you so much for sharing, Julia! We are so glad you enjoyed them! These were delicious!! I didn’t have any vegan worcestershire sauce so I omitted it. They were a bit soft, but that made them perfect to pull apart for smaller bites. Perfect with penne and garlic tomato sauce. Hi I’m currently making this in the UK. Looks delicious but we use imperial not metric and I’m a bit confused about the weight for the quinoa (1cup) i understand the amount in grams varies depending on what’s inside the 1 cup from online searches. So confused! Also is it 1 cup dry or cooked quinoa? Going to give it a go as probably won’t hear back in time but please do let me know for next time. Thanks! Hi Nina! This recipe calls for 1 cup (or 6.5oz) of uncooked quinoa. These were so tasty and such a good texture. Do you have any thoughts on how this mixture would do as a meatloaf? And if you think it would work, any ideas on how you would go about setting up the cooking time and temp? Yes, I think that would work! You may find that it needs to be baked longer in loaf form, but we haven’t tested it out and can’t say for sure. Report back if you give it a try! I made these last night and they are DELICIOUS! I can’t eat quinoa so I subbed cooked brown rice and I it worked out perfectly. Wonderful recipe! Whoop! We are glad you enjoyed them! These were amazing! I have to admit I was skeptical at first, but my whole family enjoyed them (even the meat eaters). I served these with the Cheesy Spaghetti Squash Pasta and Marinara sauce. This recipe is definitely a keeper. Whoop! Glad to hear it! These are so good I could have eaten the mixture straight out of my food processer. Thank you for helping me and inspiring me as I get back to being full vegan again. I love your cookbook too. Just the best, most beautiful meatballs. I served them over bucatini with your marinara, and it was such a rich and hearty meal full of flavor and gorgeous texture. I couldn’t have possibly been happier with the outcome. It will certainly become a staple as fall and winter make their way to us. (Now I have to try the spaghetti squash version.) Truly, so, so good. This is a wonderful recipe. The meatballs were delicious, and I really appreciated how easy they were make. I doubled the recipe and froze half of it for next time. This is an outstanding recipe. The flavour is unreal and these are foolproof. They work (and please) everyone in our house, all the time. I have modified it a bit, mainly because I like to try variations. My favourite modification is to double this recipe, varying the legumes to 1/2 black beans and 1/2 chickpeas. To the food processor blend, I also add 2 tablespoons of chia seeds (that have been turning to “gel” in 2/3 cup water for about 10 minutes). This really helps the consistency, in my opinion. I am constantly in awe of The Minimalist Baker. Every recipe works and tastes delicious. I am now converting these into “grillable” burgers. Because this recipe really does work to keep the “meat” intact, it also makes great burgers I suspect. We shall see! I have been eating a vegan diet for a few years now and have made my fair share of bean burger and bean ball recipes. These are truly the BEST I have ever made. I followed the recipe as written with a few exceptions. I added in all the optional ingredients except the red pepper flakes as we did not want any spiciness. I did not saute the veggies because, well, I am lazy. I also did not brown them in the pan before placing them in the oven (we do have oils in the house… and well… still lazy). I go straight from fridge to oven for 20 minutes then flip and cook for another 10-15 min. The come out crispy enough on the outside for us using just the oven. My husband (who still eats meat out but no animal products at home) LOVED these as did my parents, siblings, and even my 3 year old niece who is even picky about animal foods. We’ve made these several times, never heated in sauce. Last time we put our leftover cooked beam balls into a dish, put some sauce on top, then a slice of the new Daiya provolone cheese slices…into the oven at 425 for about 10 minutes then under the broiler to brown the cheese. Made bean ball subs that tasted AMAZING. Thank you SO SO SO SO much. I plan to take these techniques and adapt it to a backyard burger flavor profile. Yum! Glad to hear it, Elise! Great recipe. I accidentally doubled the quinoa the second time I made it – I just added a little extra herbs/spices and tomato paste and it still worked! Very delicious on top of pasta! Very delicious meatballs. I served with noodles and marinara. Very easy to make. Yum! Yay! We are glad you enjoyed it, Kelli! I omitted the tomato paste and used this recipe for hamburgers. DELICIOUS!!! Smart! Glad you enjoyed it! this recipe is awesome, we have eliminated meat from our diet from recent heart issues and kidney and have been looking for a great recipe and this one is..my husband loved it, i didnt have quinoa, but i had brown rice,red and wild rice with quinoa and it worked perfectly..tks again for this recipe!! Wow.. the flavor! The flavor is so amazing! I did NOT expect it! And the texture is wonderful! I made these exactly as written, aside from using any Worcestershire sauce because I just didn’t have any. I left that out and made everything else exactly as instructed and oh my goodness, perfection! Next time I’m going to make an extra batch and instead of shaping into meatballs, I’m going to try browning it and adding it to my spaghetti sauce for a “meatier” sauce. I think it should be delicious! Thank you for the superb recipes! You mention that the black beans need to be dried before working with them. What do you mean and how do you do that? They should be pat dry to remove any excess liquid! These were unreal ! Perfect consistency and went over great with my husband ! Seriously I will be making these again and again. Going to try making a meat ball sandwich – the flavors were fabulous !!! Thank you ! Yay! We are glad you enjoyed them, Risa! These meatballs were delicious and easy to make. I did not make any changes, they were perfect the way the recipe was written. Glad to hear it, Leonie! I made these for supper last night and they were delicious! I really appreciate the suggestions to adjust flavor to taste (more salt for depth of flavor, more herbs for earthiness, etc). For my taste the Worcestershire sauce really enhanced the flavor. We served these as “spaghetti and meatballs” and I will definitely be making them again. I made these tonight and thought they were really tasty. I was out of oregano, but they tasted fine without it. I liked the texture as well. My daughter has recently started eating vegan, so I really appreciate all of the great recipes here (and in the Everyday Cooking cookbook). This is a great recipe and will be part of my regular rotation! Confession: I made burgers instead of meatballs and have no second thoughts about using it as a meatball recipe too. Curious to know if this recipe would work with other types of beans, for example, red kidney beans. Or is this something special about black beans that makes this recipe work better? Thanks for sharing! Hi! Do you think this could work as a meat loaf?? I made this tonight for dinner. I pretty much followed the recipe. I also made the vegan meatballs. My husband and I loved the flavor combo. I used a marinara sauce with my meatballs from a jar. After baking the meatballs I put them in the sauce . The Cheesy Spaghetti Squash was the base layered with the marinara and Vegan Meatballs on top. Sprinkled with Vegan Parm. Talk about satisfaction! I used red quinoa. Looked beautiful too! I made these as my first Minimalist Baker recipe and i cannot tell you how much I LOVED them! Truely delicious! My carnivore husband even liked them. We ate them all between two of us in one sitting. Definitely making a double batch next time! I got about 15 balls from this recipe. I would maybe agree with other comments and leave them in the oven for an extra five mins and just pour the sauce over them so they don’t fall apart. Trully one of the best vegan meatballs ever and so easy to make! The fennel is a must – it just brings them to a completely different level! WFBP and almost oil-free too! Thank you so much Dana! Oh and forgot to add that since I didn’t have any vegan parmesan, I just added 1/2 cup of nutritional yeast and skipped the worcestershire which I would love to add but didn’t have on hand. Dana! You hit it out of the park with this one! Absolutely delicious. I would pick this over the meat version all day long (I’m not yet a fully converted vegan). The one thing that I had some trouble with was the sauté at the end. I noticed pretty quickly they might fall apart on me so I went straight for the oven and increased the heat to 425 and they browned PERFECTLY. Was able to add sauce and stir without any problem. Thanks for all you do to bring us such great content! Keep it up! These didn’t hold for me. I don’t think it was insufficient bake time because they were crumbly. Hi Kayla! Sorry to hear these were crumbly for you.. did you happen to change anything in the recipe? Let us know and we’ll do our best to help! This was (I can say) the first time i tried to make a vegan food however , it was not completely vegan for me cause were i live you can’t find any vegan parmesan. I have to say it was amazing . p.s. My sister taste it and she didn’t even understand that there is no meat in it !! I just made these and ate with my family. They are good, but maybe need to be less mushy. Maybe I blended for too long. If made with sauce, I would recommend the sauce is poured on top of the meatballs just before serving as opposed to putting the meatbals in the sauce and cooking for a bit, as they tend to fall apart. Will make again, but experiment a bit with the food processor blending time. Mine also came out slightly mushy, but the flavor was so good that I will experiment with them again. I will really pat the beans dry next time, and bake the meatballs longer in the oven to try and firm them up. I think this recipe could make a good vegan meatloaf, too. Just made these meatballs to go with cheesy spaghetti squash and marina sauce recipes and they came out so nice! This is definitely going to be my go to meatball recipe from here on out, the flavour and texture are great! Made these! They were good but I think I prefer the sundried tomato chickpea ones better. I might try these again, though and do a coating of panko before cooking. I like the addition of fennel seed. I crushed mine with a mortar and pestle but I might really grind it up next time to get disbursed more evenly. I also liked the Worcestershire in it and just did 1 tblsp so I’ll increase it to 2 next time. Yay! We are glad to hear that, Chaya! I streamlined to feed the kids faster. I didn’t sauté the garlic and onion. I just threw it raw in the food processor. I didn’t refrigerate. I didn’t sauté the balls – I just stuck them straight in to bake. They were fantastic. I thought they would be a hit when I found my 9 year old rating them raw. I am sure the extra steps would make them out of this world, but my streamlined version was pretty darn tasty! Delicious – Thank you! Great recipe, a little more involved but worth it for the crust and tesxture balance. I froze half the recipe so will wait and see what they are like defrosted but I will definitely be doing these again. Ok soooooooo I am eating these right now and they are absolutely amazing… I did sub kidney beans for black and real parmesan for vegan parmesan. I also changed up the spices and used what I had but did include fresh basil from my garden. Everything I make from your recipes is amazing! My family will be fooled. I am deff making a huge batch of these and freezing for fall! Thank you Thank you Thank you! Oh by the way I made them half the size you suggested and the came out to just 1sp each for my weigh watchers friends!!! Thanks girl! You do awesome work! We are glad to hear that you enjoyed them, Gabrielle! Thanks for sharing your recipe subs! I can’t use any kind of bean or lentil. Is there a non-legume substitute you can recommend? Looking for vegan burger and meatball recipes that don’t use beans. So hard! Hmm I can’t think of any sub that isn’t bean or lentil based at this moment, but if you experiment with it, report back! I never had vegan meatballs in SUCH a long time. Would this recipe work with pinto beans as well? We haven’t tried using pinto beans, but I would think it should work! If you give it a try, report back. Good luck! We are glad you enjoyed them, Jessica! I absolutely loved these! My husband and sons are meat eaters, so it was a delight hearing me say that these Vegan ‘meatballs’ were better than the real thing. I made the mistake of not putting my ‘meatballs’ in the refrigerator as your recipe says to do. I think that explained why they stuck to the cast-iron skillet. Definitely a winner – great job Dana. ops – typo (my husband and sons are meat eaters, so it was a delight hearing them say “these Vegan ‘meatballs’ were better than the real thing. We are glad that you enjoyed these, Tracy! Tried these and they were amazing! What flavor! I used ground fennel, I think fennel flavor essential for a meatball experience. Can’t say how they will hold up in sauce, since I was so enamored of them I couldn’t bring myself to ‘adulterate’ them with marinara. Am thinking of trying these in a brown gravy though, a la ‘Ikea style Swedish meatballs’. The semi-dried beans is a stroke of genius, lends such perfect texture. ha! Thanks for sharing, Miranda! Made these with kidney beans as I didn’t have black beans. They were fantastic! Had them with spaghetti and homemade sauce…will have leftovers on a sub! Terrific recipe! I made these and while I was expecting them to be good, I was NOT prepared of how good they are! The texture is great, and the flavor is out of this world!! I upped the garlic and ended up adding more salt (personal palate preference! ), used a mix of parsley and basil, and also ended up using just over a cup of quinoa (1/3 cup dried –> about 4/3 cup cooked, and I wanted to just use it all up). I mention this because the only *minor* difficulty I had while making them was having them get a bit fragile in the pan while browning before putting them in the oven…and my guess is that my liberal measurements may be somewhat accountable for that. So great! thanks for sharing, Carolyn! Would lentils substitute for the beans here? We haven’t tried it, but it sounds like in earlier comments people had success. Let us know if you give it a try! This looks amazing! For the quinoa – is that 1 cup dry that’s then cooked, or cook first and just use 1 cup of it (assuming it grows a bit as you cook it). thanks! 1 cup cooked + cooled! I am still not quite clear whether to measure the dry quinoa or the cooked quinoa. Thanks. 1 cup already cooked and cooled. Does 1 cup quinoa refer to 1 cup dried quinoa before cooking or 1 cup cooked?? She says to have it already cooked and cooled so I’d assume 1 cup cooked ? I made these for Sunday dinner and we loved them! I made quinoa in the Instant Pot (1 cup quinoa + 1 cup water for 1 minute. Seriously.) and used my Air Fryer to cook both the black beans (380 for 8 minutes) and then to finish cooking the meatballs (370 for 7 minutes) . I had some leftover cashew alfredo sauce that I used, but thought a marinara would be better. I used half the red pepper and fennel suggested and loved the result. This will become a regular! Smart! Thanks for sharing. And especially helpful for those with an instant pot or air fryer (two things we don’t have much experience with). xo! Made this tonight, bursting with great flavor. Mine were a little moist though but then again I’m not sure what I was suppose to expect. Held it’s shape nicely. Maybe I should’ve cooked for 30 minutes instead of 20. I’ll sill eat my leftovers though. Yeah, go a little longer when in doubt. That way you know they’ll hold up when sauce is added! The pepper flakes were definitely noticeable so leave those out if you don’t like heat. I was tempted to heat the cooked meat balls in sauce, like you have in the photos, but I think they would have broken apart if I’d done that. These were great with sauce and zucchini noodles, but I also think they would work in a pita with salad and tahini. Is that weird?! We are glad you enjoyed them, Lydia! You could absolutely add these to a pita with salad and tahini! These are excellent. I left out fennel and used onion instead of shallot. Huge hit with my kids and hubs. Next time, I’ll double batch and decrease red pepper for toddler. Another home run, Dana! Delicious Dana,…. You’ve created a very good vegan Meatball recipe. I used N.Y with macadamia instead, that’s what I had for vegan Parmesan. I didn’t have fennel but I’ll try next time. I thought the recipe would be time consuming or too much to do but it went smoothly. Thanks again for sharing this recipe. “I’ll be back” to try more. would this work for a hamurger patty? Yes! I’d also recommend checking out this recipe! These really are the best ever!! We made these last night for dinner, and I honestly cant wait to have the second half for lunch. Definitely a must have!!! Stephanie – How many balls did the recipe make? There should be around 14, judging from the picture of the pan and the nutritional information below the recipe :). Looks really yummy! I’m confused about the serving size. Does the recipe make 14 meatballs, so each one is a serving? Amazing recipe -made it last evening. Newfound favorite for this household. Thanks, love your site and brilliant recipes! The questions and their answers are not posted together, so it’s best to reference which question you’re making a suggestion for. For the example, “Try oats” doesn’t tell us which ingredient the oats are in place of. A more clear answer would be, “Try ground oats in place of the cashews.” Thanks. We hope you love it, Dannielle! Looks delicious! Can’t wait to try this recipe. I especially love all the wholesome ingredients. 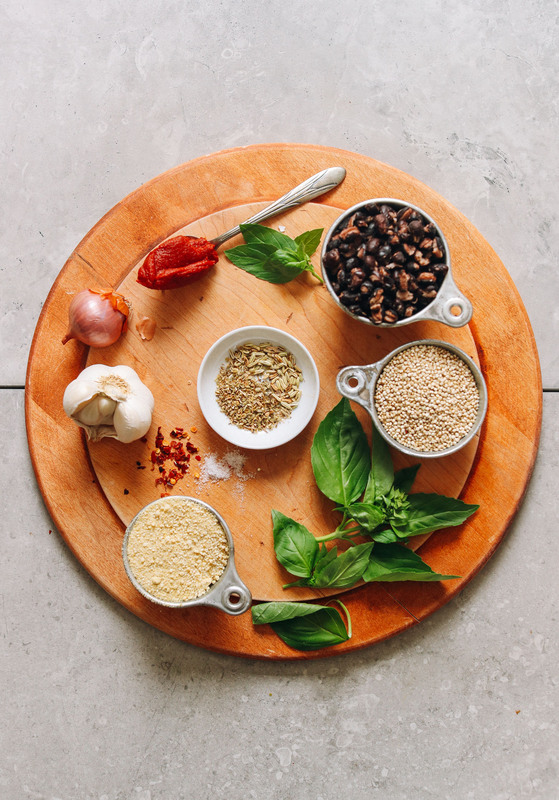 We appreciate all your efforts that bring tasty vegan recipes into our home! Made the meatballs. Followed instructions as given and although very tasty they did not hold there shape when warmed in marina sauce. I had same problem with falafel recipe. Yes the beans were dried and cracked in the oven. Any thoughts? Hmm, perhaps the sauce was added too early, before they had a chance to dry and form. Try baking for longer before adding sauce. I’ll add that in the notes! I had the same issue but I think that for me it was because I used the trio of quinoa. I also felt like it took forever to make but that may be the fact that my son was running around me the entire time and I kept having to make sure he wasn’t doing something crazy. Cooking in sauce broke them apart immediately but I would say perhaps it was because they were too dry rather than not dry enough. Just my guess. They were delicious! Has anyone made a big batch of these and frozen them? Can these be frozen and reheated for future use? I am curious if I can make a huge batch and freeze some for quick spaghetti dinners in the future. Yes! A month in the freezer! Reheat in the oven on a baking sheet or cast iron. Add sauce to moisten! How do you dry the black beans? I’m sure the term “dried” means to pat the beans dry with a paper towel, not “dried” as in dehydrating them. Hope that helps. 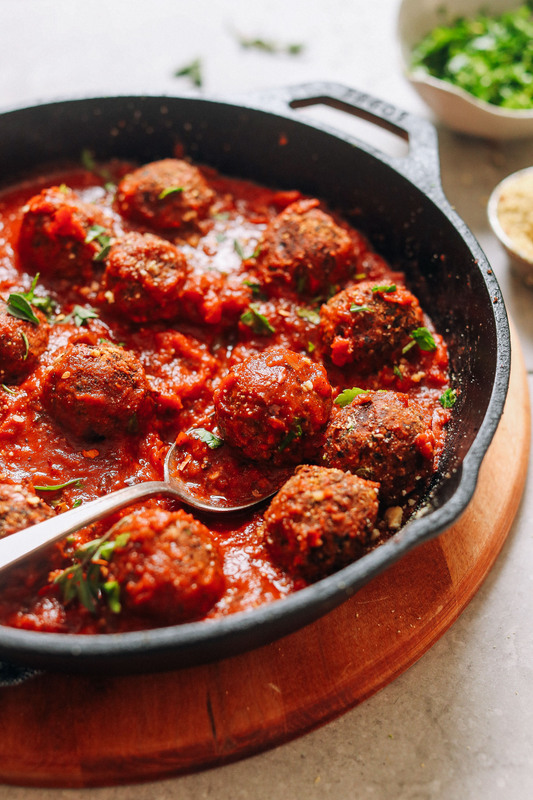 In her blog she states, “This 10-ingredient recipe starts with black beans that have been baked to dry them out – this is important, as it helps prevent the meatballs from becoming mushy. Yes, but you start with the patting them dry and then putting them in the oven to bake them to a dried state. It is probably done to cut down on the moisture when baking them. We’re really splitting hairs on this. Yes, pat dry, then bake to actually “dry.” Thanks for the help, all! See #2 in the “Instruction” section of the recipe. I love quinoa but it hates me. Any suggestions for a substitution? Gluten not an issue. Try Quaker 1 minute oatmeal. I use it in place of most things of th is type of texture. Good luck! I’d say millet or amaranth would be nice! HI, I have a nut allergy and almond meal and flour are out, what do you recommend as an alternative? I would love to make the Banana Bread. Hi Sue, maybe grind oatmeal into a flour. It would be regular not quick cooking. Have a great weekend. I use ground pumpkin or sunflower seeds to replace almond meal since I have an almond allergy. Have you ever used marmite (or vegemite) in recipes? It’s a tip from J. Kenji Lopez-Alt (with whom you share a #1 spot when it comes to my favourite food gurus) and also adds incredible depth to recipes while you won’t taste it by itself – a good thing if you ask me. Vegan worchestershiresauce is almost impossible to get around here while marmite I can get at the local grocer. Does it taste the same? I haven’t tried vegan worchestershire sauce. I have Marmite though because Gaz Oakley from Avant-garde Vegan uses it in some recipes. I haven’t had vegan worcesershire sauce in over a decade, so find it hard to tell how similar the flavours are. However, I do know they are both typically* used as a background flavour and umami bomb, as well as to add more salt. The idea is not to taste it by itself but allowing it to enhance the other flavours, which both do. In a recipe like this marmite seems like a no-brainer to me (though instead of worcestershire sauce, together may be a bit too much), but I use it in many things, mock meats; stews; soups… really anything that can use some je ne sais quoi savoriness. Typically about a teaspoon of the stuff is enough, but experiment with it I’d say. Can you make them ahead and reheat and how long can you store them in the fridge? Think this is more a question for Dana than me (random commenter) but above the ingredients she states it stays good for 4-5 days and can be frozen up to 1 month. I haven’t but that sounds like an interesting addition! What about coconut aminos instead of Worcestershire sauce? Marmite is delish. Unfortunately, it’s not gluten-free, so beware, those of us who are gluten-sensitive or intolerant. Wow do these look banging! However, I don’t have a food processor. Would it be possible to simply mix this up by hand? I do have a big vitamix-type blender, but that seems dicey to me. What do you suggest? So, the beans do need to be mixed really well with the seeds and everything, so I’d say start in your vitamix type blender. Then transfer to a bowl to mix the rest! Can I sub adzuki beans or chickpeas in place of black beans? I used green lentils. Growing up in an Italian-American household we often ate lentils made with leftover Sunday gravey (marinara) during the week. Chickpeas can be a little tricky, but adzuki would be the next best thing in my opinion! Let us know if you give it a try. Hi ! I tried with half canned red beans and half chickpeas ( what i had in my fridge 😅) and the taste is amazing too ! Looks amazing! Would it be possible to replace the quinoa with rice or some other grain? I never have it on hand. Thanks! I think that rice or couscous will work good enough in this recipe. Wait, what? Tell me about this mushroom technique. I just tried it with whole grain brown rice and it was absolutely bomb. My toddler stuffed his face. If you don’t have a seed allergy, you can substitute hemp seeds and/or sunflower seeds in the vegan parm recipe. I have done both and a mixture. I personally like hemp or mixing them! Is there a way to leave out the parmesan to make it fat free? I also am allergic to nutritional yeast, so I don’t want to sub that. Would I just add brown rice flour or something to retain the bulk? I think that could work, Shannon! Let us know if you experiment with it. Hi ! I just tried the recipe without any parmesan and it turned out just amazing too, so yummy ! Oh awesome! Did you sub it for anything, or just continue as written? No i just skipped it !